How to make a complaint of misconduct to the Commission? What are the particulars should be included to make a complaint to the Commission? f) Any other details including photographs and documents that is necessary to be included in the complaint. Can a person complain about a misconduct which occurs while an enforcement officer was not on official duty? Yes, he/she can. According to subsection 24(2)(b) of Act 700, the misconduct of an enforcement officer may be investigated by the Commission although the act or inaction occurs while the enforcement officer was not on official duty. How does the Commission deals with a complaint of misconduct after it was received? After a complaint was received, the Complaints Committee shall conduct preliminary investigation in order to determine the nature of the misconduct complained of and whether the Commission should proceed with a full investigation into the complaint. The complainant will be called for a statement recording under section 112 of the Criminal Procedure Code. Will the Commission attend Anonymous Letter? Yes, the Commision will accept all types of complaints, including anonymous letter under the provisions of subsection 23 (3) of Act 700. If the Commission found the anonymous letter has a basis of complaint, it will be referred to the Disciplinary Authority of the agency and if none it will be rejected. What is the action taken by the Commission against false accusation? If the preliminary investigation found a false complaint, the Commission may take an action against the complainant by lodging a police report. Is the finding of the Complaints Committee final? No, all findings and recommendations by the Complaints Committee shall be reported to the Commission for its consideration and desicion. If the commission is not satisfied with the report and recommendation or finding of the Complaints Committee, the Commission shall direct a further investigation into the complaint. The findings of the investigation shall be reported to the Commission within fourteen (14) days for a final decision. Does the Commission conduct full investigations against all complaints received? • the subject matter of the complaint is trivial;. • the subject matter of the complaint has been finally determined by any court or is the subject matter of any proceedings pending in any court, including any appeal proceedings. What happens if a complaint is referred to the appropriate Disciplinary Authority or MACC? According to subsection 27(3) of Act 700, the Disciplinary Authority or MACC shall conduct its own investigation and communicate its finding to the Commission within thirty (30) days from the date of receipt of the complaint from the Commission. What are the investigation powers posessed by EAIC if the Commission decided to commence full investigation into a complaint? Subsection 17(4) of Act 700 - The members of a Task Force shall have all the powers of investigation as contained in the Criminal Procedure Code. • Power to search and seizure without warrant [section 41 of Act 700]. Could the Commission intervene the investigation conducted by the enforcement agency? No it can't. The Commission only has the power to investigate complaints of misconduct. Does the Commission have jurisdiction to pass sentence or to institute prosecution on its own upon completion of full investigation? it shall record its finding and inform the complainant. Do all findings by the Commission and any action taken by the Disciplinary Authority or the Public Prosecutor be communicated to the public? According to subsection 30(5) of Act 700, the Commission shall make public its finding and inform the complainant of its finding and any action taken by the Disciplinary Authority or the Public Prosecutor. Will the complained officer be notified regarding the Commission's Investigation decision? Yes, the investigation's decision by the Commission will be informed to all parties including the complained officer. When was the Enforcement Agency Integrity Commission (EAIC) established? What are the functions of the Commission? (h) to conduct site visits to the premises of an enforcement agency, including visiting police stations and lockups in accordance with the procedures under any written law, and make an necessary recommendations. In addition to that, as provided under subsection 4(2) of Act 700, EAIC shall have power to do all things necessary for the performance of its function. What are the scopes of misconduct that can be complained to the Commission? (v) committed on improper motive, irrelevant grounds or consideration. (c) any criminal offence by an enforcement officer. • Complaints are not taken properly by an enforcement officer / failure to record the details given by the complainant. • The investigation took too long and the complainant was not informed about the status of the investigation. • Delayed investigation by an enforcement officer. • Charges imposed without facts and applicable law. • Instructions or actions taken by an enforcement officer to accomodate / in favor of certain parties. • The investigation papers closed (No Further Action) too fast 1-3 days. • No action taken by enforcement agency despite crime has been reported and criminal are identified. Who can complain about misconduct to the Commission? According to subsection 23(1) of Act 700, ANY PERSON can make or refer a complaint of misconduct to the Commission. Can a person make a complaint of misconduct on behalf of another person? Yes, a person may complain about misconduct even though the person is not the victim of the misconduct complained of. However, that person shall furnish the Commission with the particulars of the said victim. What are the enforcement agencies under EAIC supervision? Although the Commercial Vehicles Licensing Board and the Registrar of Business have also been prescribed in the Schedule of Act 700 but both of the agencies have been dissolved and its functions have been absorbed in Land Public Transport Commission and Companies Commission of Malaysia respectively. Is Malaysian Anti-Corruption Commission (MACC) subjected to the supervision of the Commission? No, according to subsection 1(5) of Act 700, MACC established under the Malaysian Anti-Corruption Commission Act 2009 (Act 694) is not subjected to the jurisdiction of this Commission. Can a complaint be made or referred to the Commission about misconduct that took place before Act 700 came into force i.e. before 1 April 2011? No, as provided in subsection 1(3) of Act 700, the Commission can only investigate into misconduct complained of occurring on or after the Act 700 came into force. Does the identity of the complainant be kept confidential? (c) it is a policy decision by the Commission that all comlaint manahement process shall be transparent. Thus, the identity of complainant will be revealed when it is deeemed necessary and just by the Commission. Do witnesses who are going to give / have given evidence before the Commission be protected? Yes, according to section 44 of Act 700, it is an offence when a person threatens or injures witnesses who are going to give / have given evidence before the Commission. Upon conviction of the offence, the person shall be liable to imprisonment for a term not exceeding two (2) years or to a fine not exceeding one hundred thousand ringgit (RM100,000.00) or to both. Is an act of contempt against a Commissioner an offence? Yes, it's provided under subsection 45(1) of Act 700 that upon conviction of the offence, a person shall be liable to imprisonment for a term not exceeding two (2) years or to a fine not exceeding one hundred thousand ringgit (RM100,000.00) or to both. What does an "act of contempt" means? (b) at any other time and place on account of him proceeding in his capacity as a Commissioner. 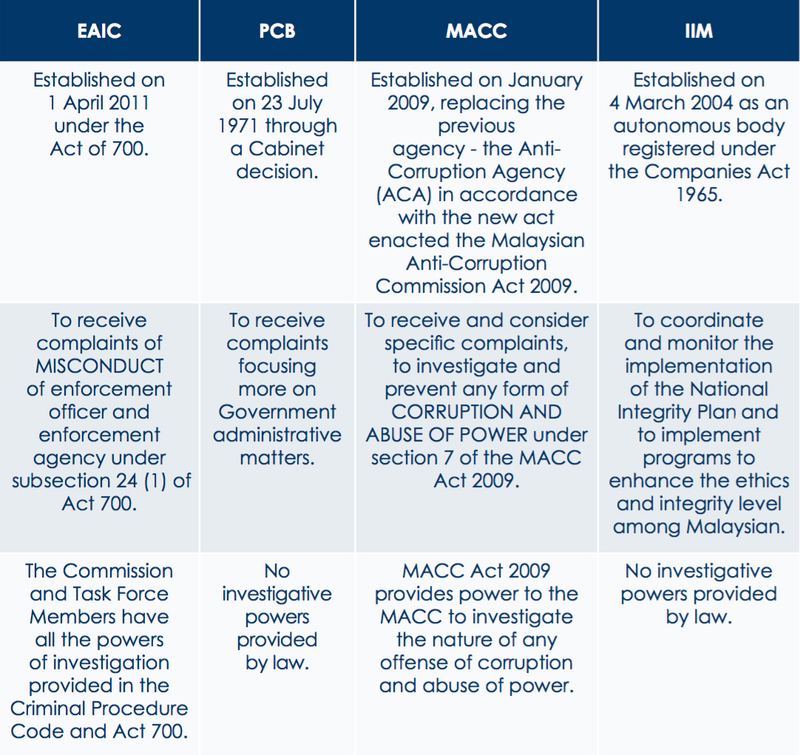 The differences between this Commission (EAIC), Public Complaints Bureau(PCB), Malaysian Anti-Corruption Commission(MACC) and Malaysia Institute of Integrity (IIM). The Malaysian Government may provide links to other websites. Those websites are owned and operated by third parties thus the Malaysian Government has no control over such sites and sources. You acknowledge and agree that the Malaysian Government is not responsible for such external sites or sources and does not endorse and is not responsible for any contents, advertisement, products or other materials available from such sites or sources. You further acknowledge and agree that the Government shall not be responsible, directly or indirectly, for any damage or loss caused by or believe to be the cause of or in connection with the use or reliance on any contents, goods or services available on or through any such sites or sources. The Malaysian Government may terminate your access to any part or all of the services and any related services at any time, with or without cause, with or without notice, and is effective immediately. The Malaysian Government may also terminate or suspend your account for inactivity, which is defined as the failure to use the portal through the account for a certain period. You agree that the Government shall not be liable to you or any third party for termination of your access to the service. The Malaysian government has the right to change, modify, delete or add to these terms at any time with prior notice. However, in an emergency or to protect the security of the portal or in other circumstances beyond its control, when the Malaysian Government finds it necessary to change, modify, delete or add to these conditions, it will do so without prior notice to you. It is agreed that you will access and review these terms from time to time for latest changes, modifications, deletions or additions. You further agree and accept that with your continued access and use of the conditions (as amended or modified from time to time) shall be deemed to be your acceptance of such changes, modifications, deletions or additions to these conditions. The Malaysian government has the right to modify or terminate the service (or any part thereof) either temporarily or permanently, at any time with or without notice. You agree that the Government shall not be liable to you or any third party for any modification, suspension or termination of the service. If any provision of these terms is unlawful or illegal or against the regulations, at present or in future, such provision shall be severed and these conditions shall be construed as if the illegal provisions do not exist and these conditions along with the other provisions will be in full force without being affected by the unlawful or illegal provisions. No personal information is gathered during the browsing of this website except for information given by you via e-mail. What will happen if I link to another website? Latest technologies including data encryption are used to protect the submitted data and strict adherence to security standards is maintained to prevent unauthorised access. All electronic storage and transmission of personal data will be protected and stored with appropriate security technologies. Whilst every care has been taken in the preparation of the information contained in this web portal and blog, no guarantee, expressed or implied is given by the Enforcement Agency Integrity Commission or the Government of Malaysia as to the completeness and accuracy of the information provided, and the Commission and the Government of Malaysia are not responsible for any errors or omissions which may occur. The Commission or the Government of Malaysia shall not be liable or responsible for any damages whatsoever, including, without limitation, special damages, indirect or consequential damages arising out of or in connection with the use of or reliance on the information contained herein, whether by action in contract or tort or otherwise howsoever.